Kickin & Screamin: GOODNESS GRACIOUS, GREAT BALLS OF FIRE! I must admit information graphics relating to pirates are my absolute favorite. I simply adore pirate information graphics. That being said here is another one to muse over. Though I am not at all certain whether this contains actual information or if it is a farce and a sham, the content made me giggle nonetheless. I mean what important information to communicate and I assume one would be able to reach a completely new and different demographic with that information and thus help fight global warming. On the flip side my critical mind would like to say whoever is designing all these pirate statistics is not representing the information in the best possible way. This graph needs to have the axis rearranged or the numbers need to start with the low number on the left and get larger as they proceed right. 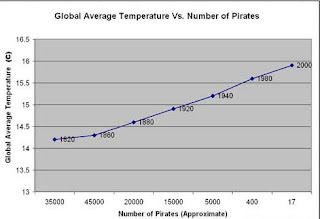 Because at first glance this definitely looks as the pirate population is increasing with the temperature, which is not the case. Though I'm sure pirates like the tropical climates just as much as anybody it probably cuts down on their pillaging so instead of leading a piratey life they become just another beach bum soaking up the rays. A revision is in order.